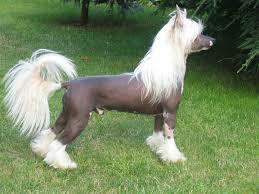 Some people not familiar with the Chinese Crested call it ugly and can hardly stand to look at this hairless breed. Those that know and love it have an entirely different opinion. They describe the breed as expressive, happy, energetic and very attached to their caregiver. Some even go so far as to call them a “velcro” dog because they like to physically attach themselves to their person and will hug with their paws. These dogs might be athletic and very agile, but when it comes right down to it, this breed is fiercely loyal, bond easily to their owners and will spend the entire day in bed with you if you are sick. They enjoy getting outdoors for daily exercise, but they are not a high energy breed. They are very social, but not your outgoing gregarious type and once they decide to own you, you’ll have a shadow by your side wherever you go. There are two varieties found in this breed: the Hairless, with silky hair on the head (the crest), tail (plume), and feet (socks); and the genetically recessive Powderpuff, who has a full coat. Both variants can be found in a single litter. They are slender and elegant, but beauty seems to be in the eyes of the beholder. Other Names Used: Chinese Hairless, Chinese Edible Dog, the Chinese Ship Dog and the Chinese Royal Hairless. Height: Ideally 11 to 13 inches. Their name suggests that they originated in China, but it is more likely that they came from Africa or Mexico. As with other ancient breeds, there is little in the way of written records, so historians can only speculate. 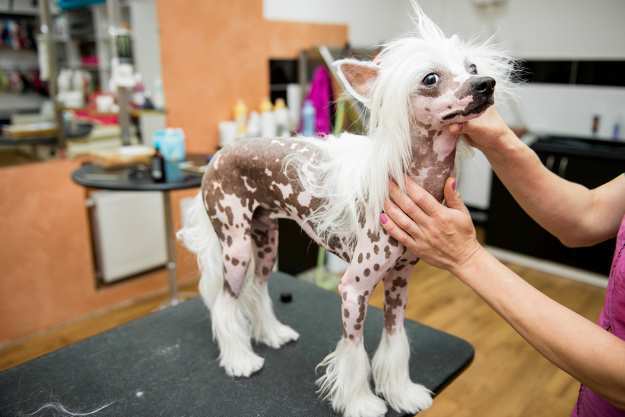 Some have theorized that the Chinese Crested is the result of the cross breeding of the Mexican Hairless and the Chihuahua which means they would have originated in Mexico. 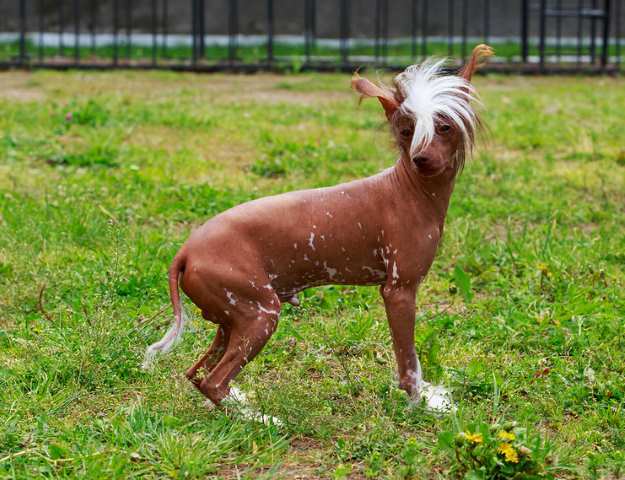 Others have speculated that the Chinese Crested had evolved from African Hairless Dogs which were reduced in size by the Chinese. Little is known of their ancient history, but it has been suggested that they accompanied Chinese sailors in 1530 and used to hunt vermin during the times of the plague. The sailors would also trade them at different ports. The Chinese looked at these dogs as having magical healing powers, but they also had a more mundane purpose: A Living Heating Pad. They began to appear in European paintings by the 19th century. Originally these dogs were called the Chinese Hairless, Chinese Edible Dog, the Chinese Ship Dog and the Chinese Royal Hairless. It's unclear when the breed arrived in North America, but the first breed club was founded in 1974 in the United States. It was recognized by the American Kennel Club in 1985 as part of its Miscellaneous class, and was accepted for full registration in 1991. Thus, this ancient breed is relatively new to America. Alert, happy and highly intelligent, the Crested adores his owners. They love to kiss and snuggle and make excellent lap dogs. They are considered to be friendly, but can be wary of strangers. But to their favorite person, they will devote their entire existence. They need frequent socialization and training because they are naturally suspicious of strangers, even to the point of biting them. Expect kisses and lots of snuggle time in your lap from this happy, loving little guy once he comes to accept you as his pack. The breed has been labeled “needy” due to his high social drive to bond to his people and his distrust of strangers. These dogs can suffer from separation anxiety due to their needy and social nature. Separation anxiety occurs when they have been left too long and when this occurs, they can be barkers and display some unpleasant destructive habits. They are capable of climbing and digging if need be to escape their confinement. But when you are near, they are fine, relatively quiet and content. They do bark if they hear something and as such make good watch dogs, just not good guard dogs. These dogs do well in apartments, urban, suburban and rural locales. They cannot tolerate the cold but do surprisingly well in hot temperatures. Most owners will protect the Crested from the cold with sweaters and coats as needed. As far as heat is concerned, high temperatures don’t seem to bother them and they seem to love a good sunbath. Another surprising fact about these guys is they rarely pant and don’t drink water the way you would expect them to on a hot summer day. They do well in apartments and any other type of dwelling. 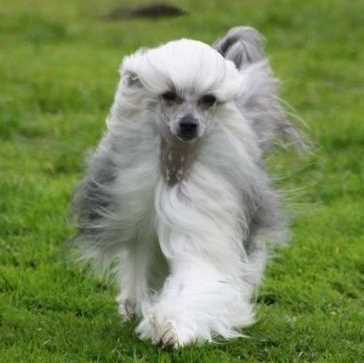 The Chinese Crested is a wonderful family dog who is playful, affectionate, and endearing. These dogs should not be left alone in a fenced enclosure because they might disappear on you. They are very agile, can scale six foot fences or even dig under them. Once they manage to sample the grass on the other side of the fence, they’re gone. They are fast and stubborn making it hard to recapture them. Chinese Cresteds are popular in conformation, obedience and agility competitions due to their athletic nature. Remember that temperament is affected by a number of factors, including heredity, early experiences, training, and socialization. This is true for all breeds. 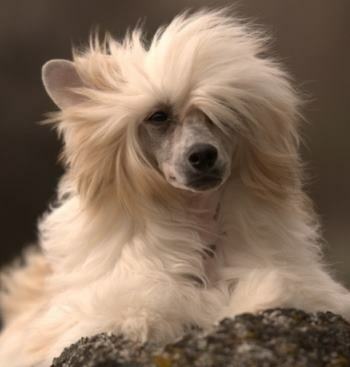 Chinese Crested are relatively low shedders but not necessarily hypoallergenic as one might expect. Since there are two versions of this breed, the hairless and the Powderpuff, each requiring different grooming, we will address each separately. 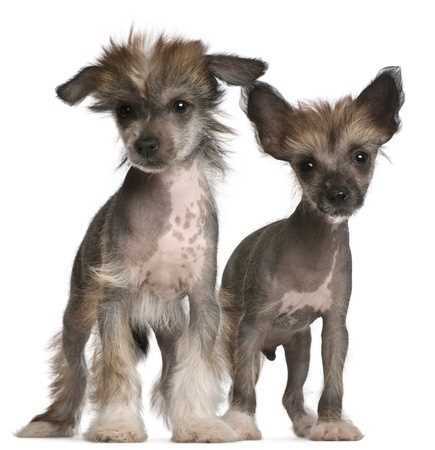 The Hairless Chinese Crested is bald except for soft, flowing hair on the head, feet, and tail. Hair on the body should be shaved to protect the skin. The Hairless should be bathed frequently with a high-quality shampoo, at least every week or two. Because he can be prone to minor skin problems, such as acne, check for any blackheads while grooming. There is some debate as to whether this breed needs sunscreen or moisturizers on their skin. Some say it is necessary to prevent them from getting sunburned and others say it lead to skin problems. Powderpuff coats come in all colors and in combinations of mahogany, blue, lavender, or copper. They can be solid or spotted. The skin tones of the Hairless are pink and black. The Powderpuff requires much more work. They have a silky double coat with an soft undercoat that will mat easily if not brushed and combed regularly. The best type of brush to use is a pin or bristle brush and the use of a metal comb will help with removing mats. The hair between the food pads also needs to be removed. Some people will shave the face. Both varieties will need to have regular dental care, nail clips and ear checks. Brushing his teeth two or three times a week can reduce the number of times he will need professional cleaning under anesthesia. His nails should be trimmed once or twice a month if he does not wear them down naturally. His ears should be checked for redness and bad odor, which would indicate an infection and usually a trip to the vet. Cresteds are generally healthy, but like all breeds, they're prone to certain health conditions. Not all Cresteds will get any or all of these diseases, but it's important to be aware of them if you're considering this breed. Just in case you have read the descriptions on other small breed dogs, you might see a pattern emerging. Most small breed dogs are prone to similar aliments.